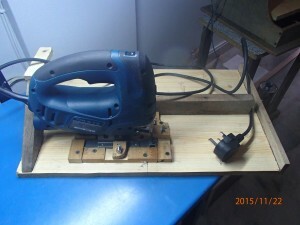 I found that the jigsaw that I bought useful for cutting plywood and other stuffs. It had an orbital pendulum movement that enabled it to cut wood faster. And it saved me a lot of time and muscle work. Admittedly, my machine was relatively cheap and I should not expect it to perform as well as a more expensive and higher quality machine. Actually, the one I bought was the best choice I could make at that time as the decision to buy was based with the cutting depth, power and price considerations in mind. It did what a jig saw was meant to do sufficiently well for the price. It also came with an attachment, supposedly to guide the jigsaw in a straight line when moving against the edge of the work piece. However, this did not perform as well as it was meant to do. I came to realize that all the youtube videos about using a guide to ensure straight cuts were not completely true. For general cutting of thin pieces of plywood, this technique might be alright, but for thicker pieces, I found it not quite adequate. What I found in actual usage was that the blade tended to divert away from the cutting path. It was a very slight diversion initially, hardly noticeable at all. Once the cut line diverted slightly, the jigsaw tended to follow the chosen path further down the line which became more and more noticeable as the cut progressed. The user of the handheld jigsaw (myself), would find that a conscious effort to bring the cutting blade back to the cutting line was needed, but only after the diversion was noticed, which by that time would have diverted so much that it no longer was a straight cut. Perhaps in my inexperience I did not put enough force against the guiding edge during the cutting. I might try doing that later. However, while trying out my new tool, I found that many things would be working against the operator. I wonder whether it would be the same if I used a more expensive branded machine. The operator of a jigsaw would have many things to focus his attention on when he was cutting: the moving blade, the vibration, the cutting line, holding on to the operating switch and controlling the speed, holding on to the machine handle, making sure the sole plate is not lifting from the base, making sure the blade does not get stuck, making sure the blade does not overheat, removing the pieces of sawdust which tended to obscure the cutting edge, being mindful of any obstruction below the work piece, and others, while all the time using only one hand to guide the machine. I suppose all these would have contributed to the unsteadiness. Well, I did not expect a jig saw to perform as well as a circular saw in cutting straight lines because that was not the nature of a jigsaw. I had chosen to buy a jigsaw rather than a circular saw at this time because of other reasons: safety, noise, cutting shape, but I found that in some ways, I would be better off doing the sawing manually. The advertisements would have you believe that the cuts will follow the reciprocating movement of the machine. 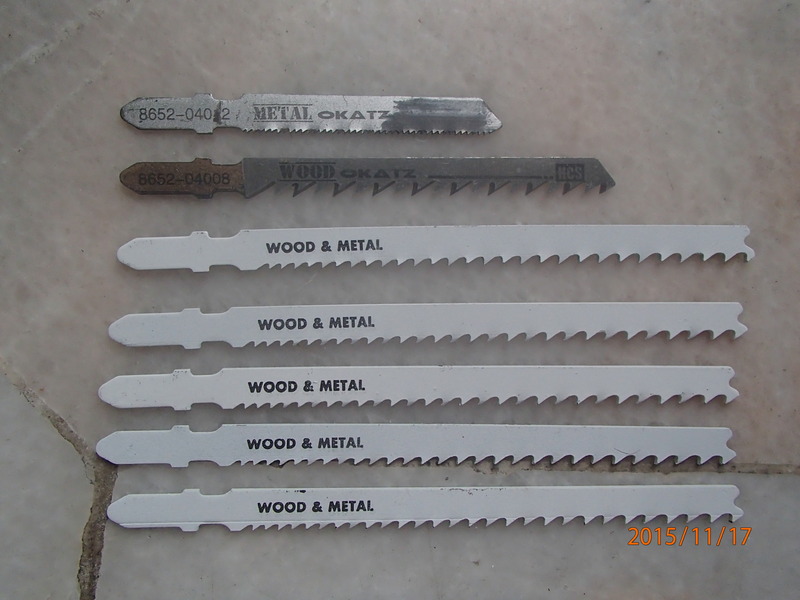 It’s true for cutting thin work pieces, but when it came to cutting thicker pieces of wood, the flexibility of the saw blades became extremely important. Using the blades which came together with the machine, the cuts were found not completely perpendicular. I had not bought any new blades yet. Maybe a better quality blade might not flex as much. But I believe the way a jigsaw functions, holding a blade at one end and sawing the work piece at a free end by reciprocating action will automatically induce some bending in the blade which will result in cuts that are not be completely perpendicular. I should not expect more than what it could do. 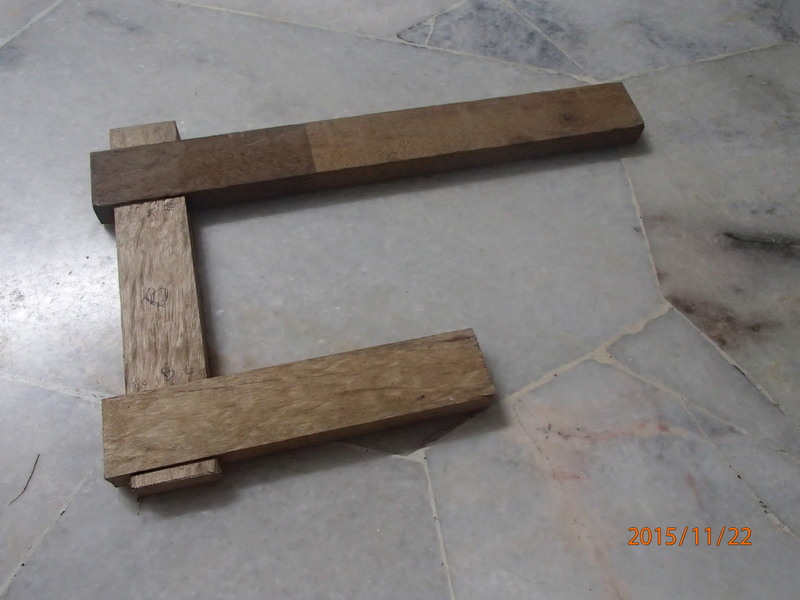 I happened to obtain a piece of MDF board which was previously a part of a kitchen cabinet. Although it was thicker than what I wanted (because the thicker the table, the less exposed cutting edge I could have from the blade), I still decided to use this as my table top for this project, treating it as my first prototype. MDF boards were not very strong physically, so I screwed in some 1″x2″ wood ribs at the back for support. 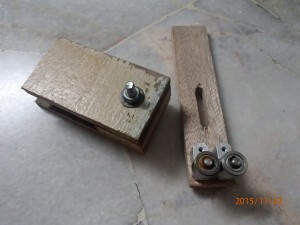 The rib also served as a clamping piece for my vise which was already fixed in position. To further support the table, I fabricated a strut and anchored it to another place near the work area. 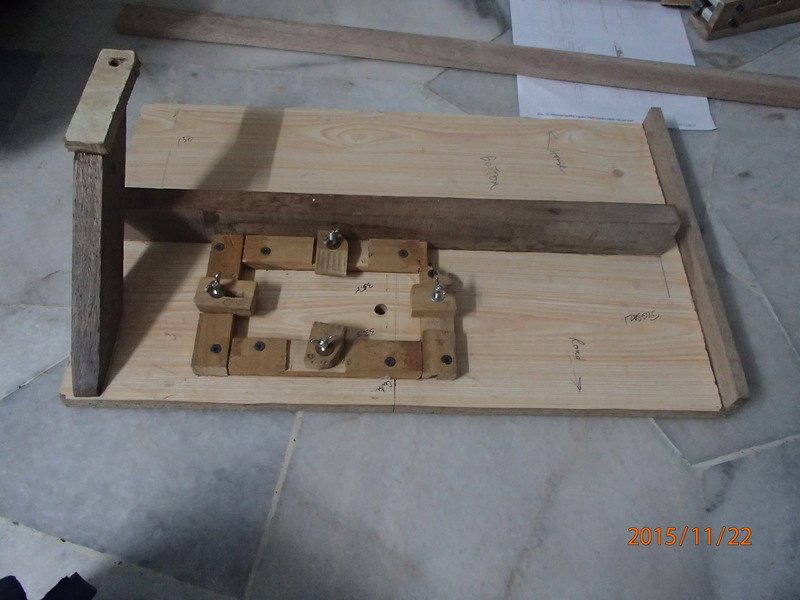 So essentially, my work table did not have any legs, but was clamped and supported by my vise. In order for a table saw to cut pieces in a straight line, it needed a fence. Again, selecting the best option, I prepared one edge of the table with a piece of 1/2″x1-1/2″ wood strip, glued it in place as best as I could perpendicularly, and used this as a reference edge. The fence itself consisted of two pieces of wood strips joined in a L-shape configuration. The ends were fabricated out of several pieces of wood of various thicknesses, fashioned into a clamp made out of a bolt and a wing nut so that the distances from the cutting blade could be adjusted when needed. The jig saw had to be inverted and attached to the table at the shoe. It must also be easily removable and be positioned accurately without any need for adjustments. In order to do that, I fabricated a border for the jigsaw shoe out of 4 pieces of 1/2″x1″ wood, attach bolts and wing nuts for the clamps, and modified the thickness of the border to suit the thickness of the jig saw shoe. 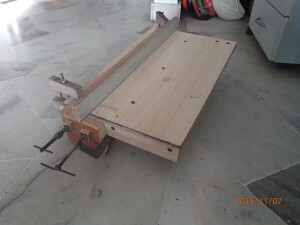 Once the jig saw could be clamped in position, a hole for the jig saw blade to pass through the table was made. 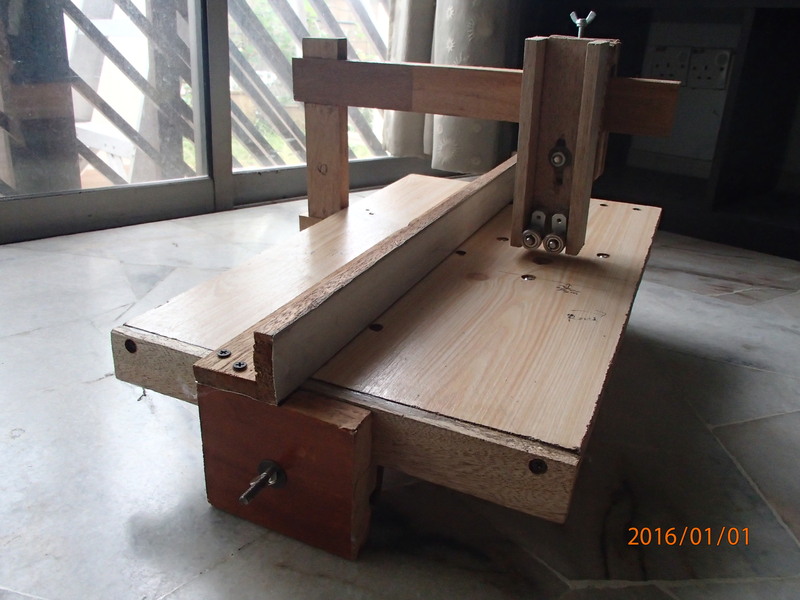 A U-shaped arm was fabricated to enable the blade guide roller mechanism to be positioned above the blade while at the same time allowing a work piece to be moved on the table. The lower portion of the arm was attached to the under side of the table while the upper portion was positioned over the table. A sliding piece which could be adjusted to move along the arm was made for positioning the blade guide mechanism over the blade. Two rollers which sandwiched the blade, allowed the latter to move up and down without swaying sideways. The roller guide piece could also be moved nearer to the work piece for better control of the side way movements. In order for the mechanism to work, the blade must be longer than a normal blade. A normal blade would be too short. I bought 132 mm long bimetallic blades just for this purpose. The jig saw was plugged into an extension cord. At this time, it was not deemed necessary to install another switch for the machine. What I did was to engage the lock-on button on the machine and switch on and off using the switch at the extension wire which was some distance away from the machine. 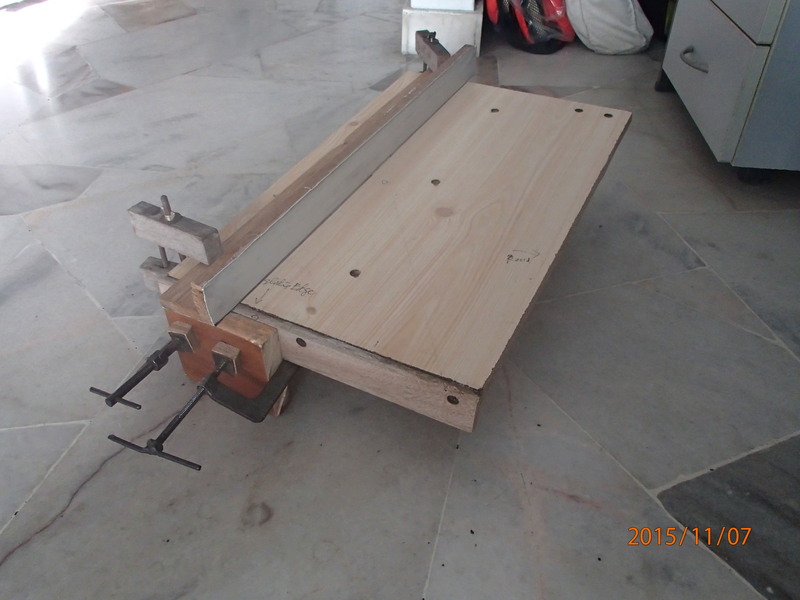 At the first test run, the jig saw table seemed to be working well.